Senior Level Designer Peter Vesti Frendrup gives details on the famous Clone Wars battlefront, coming November 28. Geonosis, the setting of the first major Clone Wars battle, joins us on November 28 as the next addition to Star Wars™ Battlefront™ II’s line-up of legendary Star Wars™ planets. The update – befittingly-named The Battle of Geonosis Update* – will also see the arrival of Jedi Master Obi-Wan Kenobi** and three new vehicles, including the AT-TE. 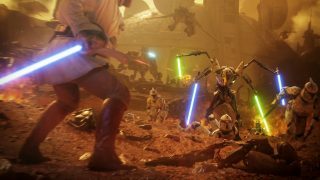 To learn more about what to expect from Geonosis and the AT-TE, we chatted with Peter Vesti Frendrup, Senior Level Designer at EA DICE. Plus, we’re giving you another work-in-progress look at Obi-Wan Kenobi. You don’t want to miss out on this one! General Grievous facing Obi-Wan Kenobi on Geonosis. Choosing a new location for Star Wars Battlefront II is a similar process as when additional heroes are decided upon. Something you can read all about in the recent Making of a Hero article. 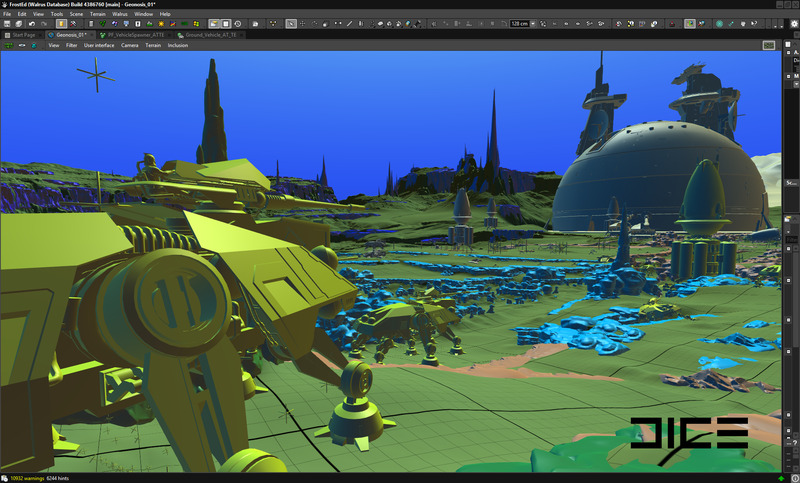 A work-in-progress, in-editor view of Geonosis’ open battlefield in Star Wars Battlefront II. 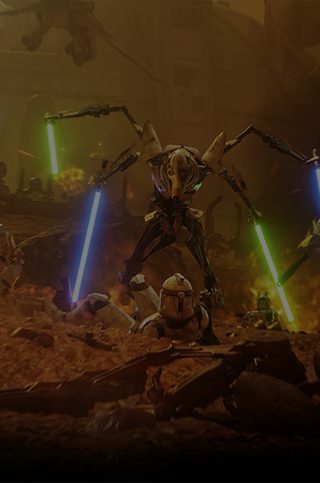 The Battle of Geonosis, as depicted in Star Wars™: Episode II – Attack of the Clones™, was fought between the Galactic Republic and the Separatists on the Geonosian home world. This dynamic, featuring two large armies, is different than a lot of other scenarios in Star Wars Battlefront II where the Resistance, or the Rebels, are up against a superior force. While the setup on Geonosis in Star Wars Battlefront II is tailored to be fun, and not to become a 1:1 representation of what’s seen in the film, the aim is for players to get that same, grand scale. “The experience of playing Geonosis shouldn’t be about a single player winning the objective for the entire team. It should rather feel like you’re being part of the largest battle yet, and you’re in it together with your team members on the frontlines. That’s been the number one focus for us,” Peter explains. There are a lot of things that we’re doing through the concepts of Living World and Battle Beyond to make Geonosis feel like Star Wars Battlefront II’s most ambitious skirmish yet. Players will see lots of lasers, fighting going on in the distance, and starfighters flying above their heads as part of the surroundings. “Another thing that we’ve done to add to that sense of scale, was to focus on the AT-TE as a fully player-controllable vehicle. We’re going to have as many of them in the level as possible,” Peter says. The six-legged walker is a beast of a machine and a true protagonist in the battle on Geonosis. Without spoiling too much, a brief overview of the location’s narrative is necessary to explain its importance. A first look at the work-in-progress animation of the AT-TE in movement. In phase one, the Galactic Republic (the attackers) must gain control of two objectives to call in heavy support in the form of multiple AT-TEs. Then, in phase two and three, the battle tanks are used to assault the Separatists (the defenders) who have besieged a droid foundry. Between phase one and two, the ticket-counter is switched from remaining Galactic Republic ground troops to remaining AT-TEs. Thus, defending or attacking the walkers is vital to the mission in a game of Galactic Assault on Geonosis. This, among other things, aims to add up to that unique, grand battle atmosphere. And, speaking of vehicles, new speeders appropriate to the Separatists – the STAP – and the Galactic Republic – the BARC speeder – are added to Geonosis along with the AT-TE. “They’re similar to the speeders already in the game, but with some adjustments made to their aiming, to make them more viable on a big, open level,” Peter says. A big battle. An open level. An experience close to what is seen in Attack of the Clones. Being a more open-ended space, some might worry that Geonosis could become too much of a haven for long-range Specialists. This is something that Peter and the team are keeping their eyes on. Arriving with the Battle of Geonosis Update too, is the much-anticipated Obi-Wan Kenobi – who you might have caught in glimpse of in our latest Community Update! And what better way to end this first look of Geonosis, than showcasing a couple of work-in-progress assets of the Jedi Master. An early test of Obi-Wan Kenobi's Idle Animation. Please note that this is from early in development and when he arrives, he will be wielding his blue lightsaber. An untextured and work-in-progress 3D model of Obi-Wan Kenobi’s Robed Appearance***. Geonosis, Obi-Wan Kenobi, and the new vehicles arrive to Star Wars Battlefront II on November 28. Until then, watch this space and EA Star Wars™ on Twitter, Facebook, and Instagram for more Star Wars Battlefront II related news.